With more than 20 years experience of UV LED Curing process, DPL Provide High quality UV LED Curing system to our clients in the world.DPL also share our experience on UV LED curing technology. For graphics printing and coating business, more and more clients are looking for the more efficient printing process to reduce production cost. Therefore, clients also need wider and efficienter web printing or coating machine equipped with wider and powfuler UV LED curing lamps. Each LED module has one LED driver with stable voltage and adjustable electric current, which provide high uniformity energy output up to 98%. Independent driver unit also increases LED module‘s working lifetime and decrease LED energy damping. DPL eAsycure LED curing system series is build up with length from 82mm to 2240mm. We also provide custom design service. DPL eAsycure LED curing system includes one set of lamp house, one set of LED Driver, one set of PLC Control system. Clients can use their own chiller or our recommend brands. To protect LED Modules’s working life, we request chiller should have flower sensor, so chiller will be automatic switch on/off according to DPL temperature sensor in lamp house. What is DPL Cold UV curing system? There are some points you have to take into your consideration before you buy UV Curing system. For most UV printer or UV curing process user, one of the biggest problems is high curing temperature. Because when a UV lamp is turned on, more than 60% energy output is IR. Therefore, UV lamp can reach over 1600C degree. As you know, most printing or coating base materials are paper or film. Neither of them can bear so high temperature. In order to solve this problem,DPL focus on developing high-quality Cold UV curing system with cold curing temperature. With our patent design of lamphouse, DPL is available to provide much low curing temperature which suitable for even thermal sensitive film. What is Ozone-free UV Lamp? Non-Ozone exhaust, which got US Pattern and proofed by EU and Danish inspection department. 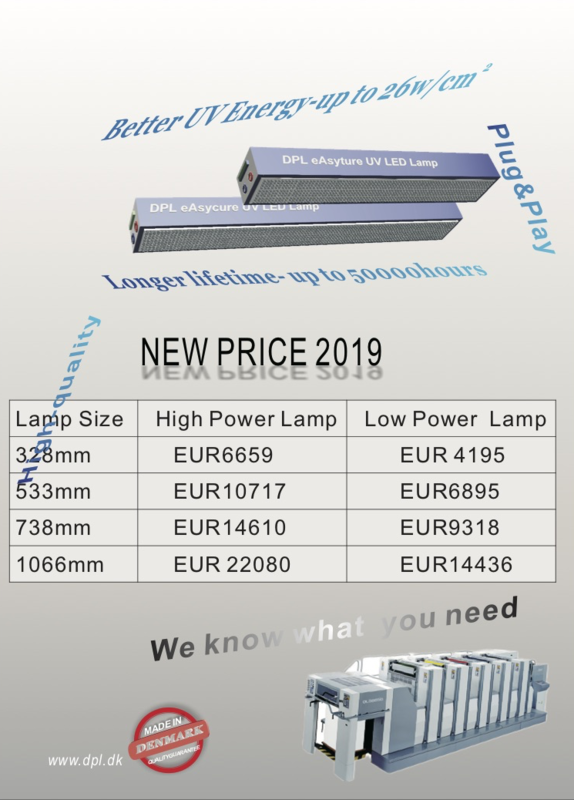 As one of the oldest UV LED Curing system manufacture in Europe, DPL starts to design and produce the first cold UV curing lamphouse in 1996. With long-term cooperation with Danish label printing manufacturer -Nilpeter and GW, DPL sold more than 3000 sets of UV Curing system in the world. After 20 years, some of DPL system are still working on these printing machines. Quanlity Means Everything to us. Experienced DPL Engineers help you improving your curing quality and modify your old machine to produce modern high-value products.